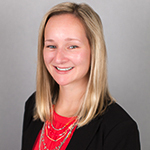 Maja Puskas, Recruiter in Friedman Williams Administrative Support division, brings over ten years of experience in customer service, sales and relationship management. Maja prides herself on being the advisor and partner in helping others with their career aspirations. She loves to cheer on her favorite hockey team, the NJ Devils, and enjoys traveling.